Yes, it’s a word. But major dictionaries label it nonstandard. Language is a living thing. No matter how many times we say it, it never gets any less true—language does resemble a living thing. It grows and changes, adapting to new circumstances, new words, new ways to use old words, and new combinations of letters and meaning. It’s a beautiful thing, the fact that language is alive. And you can use that fact to console yourself every time you hear someone say the word irregardless. Irregardless is used in the same way you would use the word “regardless.” “Regardless” means “without regard,” because that’s what happens when you add the suffix -less to a word. You might notice here that irregardless also has “regard” as its root word, and that it also contains the suffix -less. So, if there were any logic about irregardless, the prefix ir-, which has also been added to the root word, would have to bear no meaning. But it does, and that’s the problem with irregardless—it has two negations. The ir- prefix means “not,” and if you add it to a word that already means “without regard,” you get “not without regard.” This double negative is what makes irregardless a mess of a word, and an insult to the army of people who are passionate about English vocabulary. Many of them go so far as to assert that irregardless is not a real word. Is Irregardless a Real Word? However, there is a problem with the assertion that irregardless is not a real word. For one, it has a meaning. When someone uses it, you know what they are saying, even though you don’t like how they are doing it. Regardless of your dislike, it carries a meaning. And people are using it. It might make you cringe, but irregardless is in use. It’s been in use for a whole century. You won’t find too many examples of it in respectable publications that employ editors, but you will hear people say it. In fact, it’s used often enough to catch the eye of lexicographers, and it was only a matter of time before the inevitable happened. So yes, irregardless is a word you can find in most dictionaries. And it’s not because the lexicographers working on these dictionaries have betrayed the English language by allowing such a mongrel of a word into them. Dictionaries today are descriptive. They don’t tell you how to use the language or which words you should and shouldn’t use. Descriptive dictionaries simply note the ways language is being used by people. That’s how words like emoji, clickbait, and meme can get in there, and that’s how irregardless got in there as well. Granted, lexicographers have a way of noting that some of those, let’s call them unusual words, are not words an educated language user would use in formal discussions. Dictionaries add a “nonstandard” tag to such words, and they stay nonstandard until they gain enough traction to be included among the “standard” words. 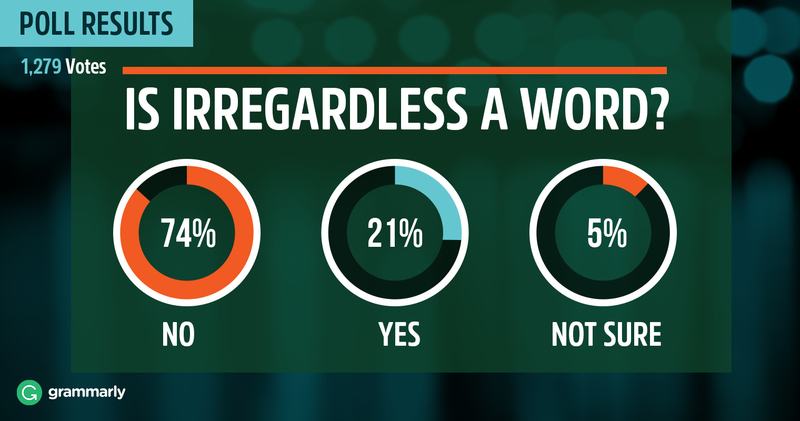 In case you’re wondering, irregardless is a nonstandard word. Can I Use Irregardless in a Sentence? If you want to, no one in this world can stop you from adopting irregardless into your speech and using it as much as you’d like. However, you should expect that when someone is grading or editing your work, it will be marked as a mistake. And you should also be aware that it might not be good to use a word a lot of people rightfully see as very problematic. So it might be best to steer clear of it, at least until it makes a run for standard status. Which could happen. Language is a living thing, you know.